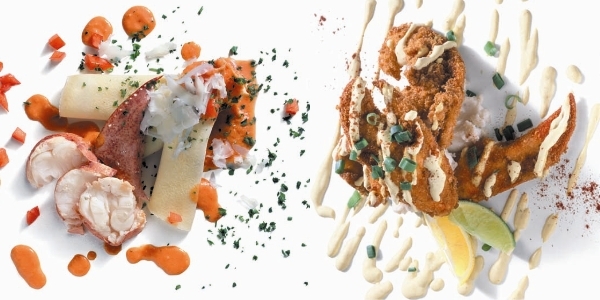 A sample selection of the recipes for Chef Tim Creehan’s signature dishes. All recipes are available in Tim’s Simple Cuisine cookbook. Heat the vegetable oil in a nonstick skillet over medium-high heat. Add the mushrooms and saute for 3 minutes. Combine the mushrooms with the next 9 ingredients in a bowl. Add the chicken and toss to coat well. Marinate in the refrigerator for 30 minutes. Combine the Napa cabbage, the red cabbage and romaine in a bowl and mix well. Spoon onto 6 serving plates. Top with the chicken mixture. 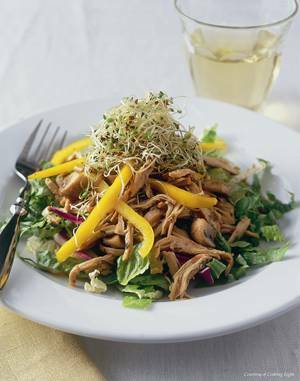 Sprinkle with the bell pepper strips and alfalfa sprouts. For the sauce, combine all ingredients in a bowl; mix well. Let stand at room temperature for 30 minutes. For the tuna, press both sides of the steaks into the pepper, coating well. Heat the oil in a saute pan until very hot. Add the steaks; sear 10 seconds on each side. Remove to a board. Add spinach to the pan and saute just until wilted. Remove to 4 large plates. 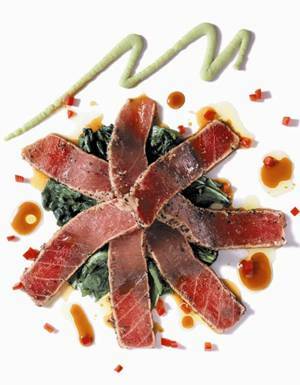 Slice tuna thinly across the grain and arrange in a star pattern over the spinach. Garnish with bell pepper, chives, and wasabi. Top with sauce. For the tulip cups, preheat oven to 350°. Combine all ingredients in a mixing bowl; mix well. Ladle ¼ cup of the mixture at a time onto the center of a greased cookie sheet to form a 7-inch circle. Bake until the edge of the cookie is brown. Remove immediately from the cookie sheet with a metal spatula; mold around the bottom of a glass tumbler to form a tulip shape. Repeat with the remaining batter. Cool cups completely. For the Sauce Design, combine the ingredients in a bowl and mix well. Pour into a squeeze bottle. For the Raspberry Coulis, combine the raspberries, sugar, and water in a blender; process until smooth. Spoon into a sauce pan and bring to a boil over medium heat. Boil 10 minutes. Remove from heat and press through a fine sieve or chinois, adding additional water if needed for desired consistency. Chill until serving time. 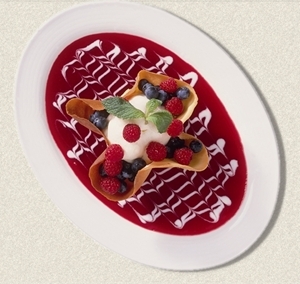 For the assembly, spoon the Raspberry Coulis onto dessert plates and drizzle with Sauce Design from the squeeze bottle. Drag a wooden pick through the sauce Design to create desired effect. Scoop ice cream into the tulip cups and top with the remaining raspberries and blueberries. Place on dessert plates and garnish with mint leaves. Sprinkle a smoker with soaked hickory chips and preheat. Cut the onions in half and place them and the whole tomatoes on the smoker rack. Smoke over low heat for 30 minutes. Allow to cool and chop. Saute the bacon in a heavy soup pot. Add the onions, tomatoes and garlic. Cook for 15 minutes, stirring occasionally. Add the next 6 ingredients; mix well. Simmer for 20 minutes. Process the mixture in batches in a blender or food processor until smooth. Combine the mixture in the soup pot; stir in the cream. Season with salt and pepper and heat to serving temperature. 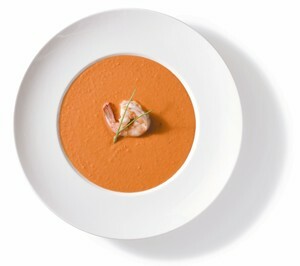 Ladle the soup into soup bowls and top with the steamed shrimp and chopped parsley or chive stems.